We have tried to cover the most frequently asked questions below that have to do with courses and your account. Simply click on any of the questions below and an answer will open. If after reading through the FAQS your question is not answered, you will find the contact button at the bottom of the page. For your convenience, this page is linked on every course page and every lesson page for quick access. 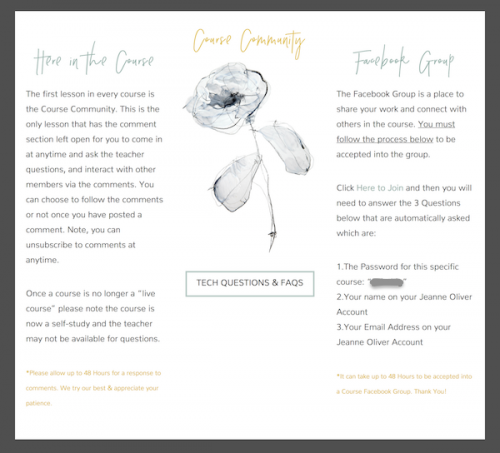 An e-course in an online class. They are simply called “Courses” here on the site. Courses are stored on this website. Each Course is in it’s own private classroom that only people that have registered for the course can access. All videos are pre-recorded and you can watch them at your convenience. 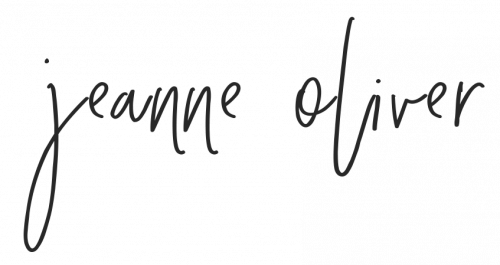 All Courses here at JeanneOliver.com have lifetime access (as long as we own and manage JeanneOliver.com). *If you are already logged in, the navigation menu will say log out instead. If you do not have an account yet, when you join a course, even a free one, it will auto generate into your account and you will receive an email at the email account you used with your account information. Note that this will also happen if your first thing is to purchase something in the shop. Everything is under one account here. You can read through the FAQS tabs to learn more about accessing your account. You ALWAYS have to be logged in to access ANY of your content. Including courses, settings, store purchases. If you can’t access the course make sure you have completed your purchase and received the confirmation email. Check your SPAM folder in your email application to be sure & also if it is in SPAM, please mark it “Not SPAM” so it does not go there next time. If you are on a course page you will find the lessons toward the bottom of the page. If you have purchased that course, you can click the lesson title to access each individual lesson and be taken to it. Again, you MUST be logged in to access the content. If you are not logged in when you click on a lesson, or have not purchased the course, it will simply lead you back to that course home page. Even if it is a FREE course. Even Free courses must go through the process of joining. Will I be able to stream Videos? To get the most out of the class you need to have a high speed internet connection and newer computer or mobile device that is equipped to stream video off of the internet. We suggest you join some of our Free Courses first and try out the videos. No. None of our videos are live. If there is anything happening like a “Facebook Live” in the coordinating Private Facebook group for a course, it will be announced in the course. This will only happen when a course first goes live and has teacher interaction. What is a "Course Community"? Yes, our videos are ipad compatible. Please do test out different browsers if you have any issues. Safari is default on an iPad, but you can also download Chrome and run as well.